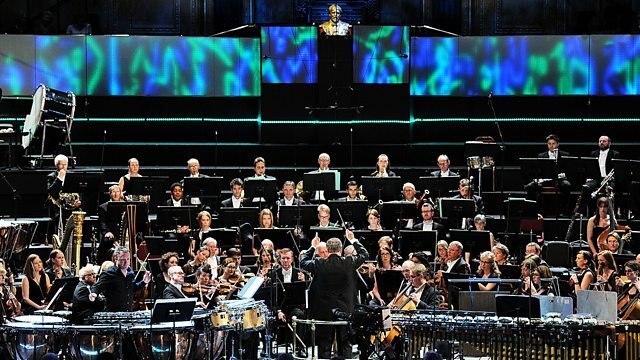 From the Royal Albert Hall, London, the BBC Philharmonic under John Storgards with percussionist Colin Currie. HK Gruber: into the open... (world premiere). Stravinsky: Petrushka. The BBC Philharmonic and John Storgards perform music by Haydn, Stravinsky and the world premiere of HK Gruber's percussion concerto "into the open ..." with soloist Colin Currie. Petrushka, with its bustling Shrovetide fair and colourful carnival characters ends a programme which begins with Haydn's symphony 'La reine', the second movement of which shares Stravinsky's sophisticated approach to folk music. Viennese maverick HK Gruber's percussion concerto 'into the open ...', echoes the ballet's vivid scoring with a vast assortment of percussion instruments from Thailand, Africa and South America. Colin Currie joins the BBC Philharmonic and its Principal Guest Conductor John Storgards. Performer: Colin Currie. Orchestra: BBC Philharmonic.